Please be advised that essential maintenance will be performed on RefWorks on Saturday 20th April between 2pm and 3pm. During this time RefWorks will be offline. Write-n-Cite will be available offline however users will not be able to sync their references with RefWorks during the maintenance period. Please be advised that Web of Science (WoS) is undergoing scheduled maintenance from 1.00 pm on Saturday 21 April until 1.00 am on Sunday 22 April. Access to the service may be intermittent during this time. Clarivate Analytics apologise for any inconvenience as a result. As ever, please feel free to contact your librarian for assistance in making the best possible use of WoS and the Library’s range of electronic resources. Click on the standard number from the search results. This navigates to the item’s bibliographic data. Internet Explorer and Google Chrome are the recommended browsers for accessing BSOL. The above steps, however, allow standards to be downloaded with Firefox at this time. Having problems reading ebooks online? If you are using the new version of Firefox, some ebooks may not allow you to read online. However you can download these or alternatively use Internet Explorer. If you have problems exporting data from Discover into RefWorks, follow our step by step instructions. 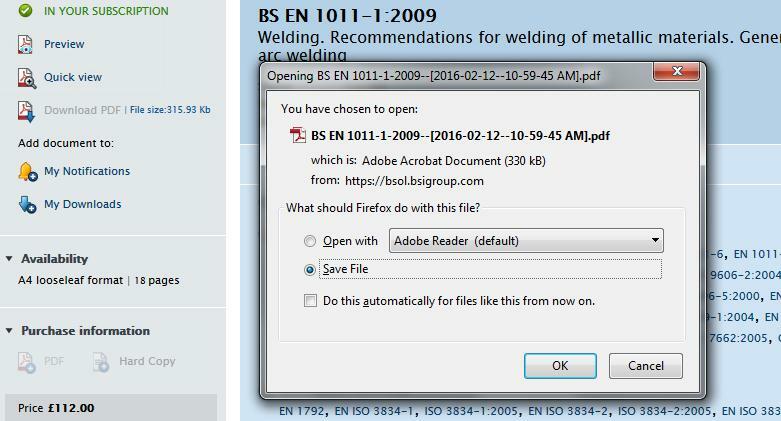 There is a current known problem when exporting references from Discover to Refworks from off-campus. We are aware of this and our suppliers have identified a solution. It has been given the highest priority with our suppliers and we hope that it will be resolved very soon. The problem is only affecting the export function from off-campus; on-campus use of the function is fine. From the page with your exported references (currently showing with the erroneous tagged format), save these references by choosing File_Save As…, naming your file appropriately and choosing Text File (*.txt) and saving it to your chosen location. Open up a Refworks session. Choose the Import option from the menu on the bottom right of the screen. A new window will open, choose Browse to find your file and then click Import. Your references will now be displayed as normal for you to manage. We apologise for this temporary problem and for the current inconvenience. Having trouble linking in to the full text of journal articles and eBooks? People have been having trouble linking in to the full text of journal articles and eBooks. The quick and easy solution to this problem is to close explorer, and use firefox browser instead. Don’t use the desktop icon to start Firefox, use the start menu. Move your cursor to the start icon at the bottom left of your screen (in the labs this is a round icon). Click the icon and the start menu will appear. On some computers, firefox will be on the list of programs, double click on it to start. In some labs, you need to start firefox by typing firefox in the run box on the start menu at the foot of the screen. The icon will then appear above the box, double click it to run the program.